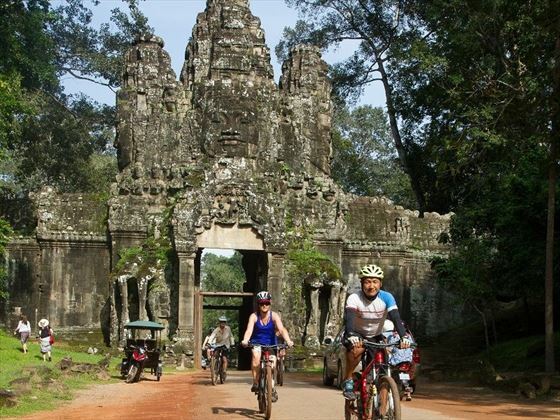 Experience a true slice of Cambodia on this classic six-day tour, which is a favourite for history, culture and nature lovers. 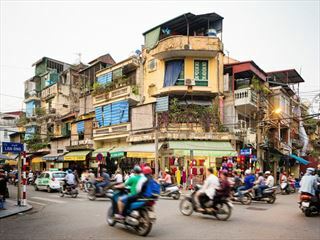 The adventure begins in the capital city Phnom Penh and takes in the nearby Killing Fields before heading west to the UNESCO-listed Angkor Archeological Park near the vibrant city of Siem Reap. To make the most of your time, an internal flight is included in the trip, as well as comfortable hotel stays. Please note: This tour is not suitable for anyone under the age of 15 years. Visit mighty Angkor Wat, the world’s largest religious building. Temple hop around dozens of other relics in Angkor Archeological Park. Learn about Cambodia’s troubled past with a trip to the Killing Fields. Shop, dine and relax in lively Siem Reap. Wander the Royal Palace and Silver Pagoda in the capital, Phnom Penh. Dine at Friends, an NGO-run restaurant that supports local young people. Welcome to Cambodia! You’ll be met at the airport and transferred to your hotel in the capital city, Phnom Penh. If you arrive early, take the chance to explore on foot and get an initial taste of the city. Optional afternoon activities include visiting the National Museum, which has a collection of Khmer crafts. Be ready for a 6pm welcome meeting at the hotel and a group dinner at Friends, an NGO-run restaurant that helps local young people with food, shelter and medical care. The organisation also trains locals to work in the restaurant, where you’ll enjoy a fusion of Western and Asian tapas. 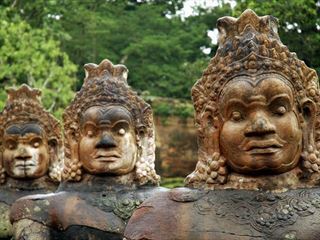 Delve into Cambodia’s past with a full day of sightseeing. You’ll visit the Royal Palace complex, which is filled with scenic grounds, decorative buildings and the striking Silver Pagoda. King Sihamoni lives in private quarters of the palace, which lies on the banks of the Mekong River. Next, you’ll confront the saddest episode in Cambodia’s history, Pol Pot’s genocidal Khmer Rouge regime, which killed an estimated three million people just over forty years ago. You’ll visit the stirring Tuol Sleng Prison Museum, also known as S21. This former school was used as a prison and torture centre in the Khmer regime and is thought to have held up to 20,000 people. Many of these prisoners were taken to the Choeung Ek Killing Fields, where they were executed. You’ll visit this moving, countryside memorial, which features a stupa made of around 8,000 human skulls, to pay your respects to the victims of the genocide. Please note that while the Tuol Sleng Prison and the Killing Fields can be emotional, they’re also a key part of the Cambodian experience. However, if you don’t wish to visit, please inform your tour leader. Alternatively, you can take a cyclo tour of the city, visit the 15th century temple Wat Phnom, or take a trip to the National Museum. After breakfast, you’ll take a one-hour flight to Siem Reap. The town is one of the most popular in Cambodia with a laid-back feel and it’s also the gateway to Angkor Wat, one of Southeast Asia’s most-visited attractions. Spend the day soaking up the city’s atmosphere and wander through the old market which is full of souveniers, fabrics and handmade arts and crafts. End the day by sampling some local street food and catching a shadow puppet show. Spend the whole day on a guided tour of the world-famous Angkor Archeological Park, which is a UNESCO World Heritage Site. There are dozens of temples to explore, the most famous is the 12th century Angkor Wat, an architectural wonder that covers 400 square kilometres and features ornate carvings and sculptures. You’ll also get to see Angkor Thom and Bayon Temple, which boasts over 200 huge, carved stone faces and 50 Gothic towers. For lunch, you’ll visit the Sala Bai Hotel School, which helps underprivileged local youths by teaching them skills to help them get a job in the hospitality industry. There’s more temple hopping in store this afternoon with a visit to Ta Prohm, one of Angkor’s most distinctive temples. Set in the forest, this gem is intertwined with tree roots and was even used as a setting in the movie Tomb Raider. To round off the day, you’ll watch the sun set over the beautiful temple tops. You have the option of rising early to watch the sunrise over Angkor Wat. Later in the morning, you’ll visit the Angkor Centre for Conservation of Biodiversity (ACCB), which rescues animals from trafficking and runs breeding programs for endangered species. Learn about ACCB’s vital work and see some of the centre’s diverse animals, which include gibbons and pangolins. From there, you’ll visit Banteay Srei Temple before choosing whether to retire to your hotel, or continue exploring. If you’re keen to carry on temple hopping, you can explore some of the quieter complexes such as the peaceful Roluos Group. Preah Khan is another favourite jungle temple with distinctive carvings and maze-like corridors. 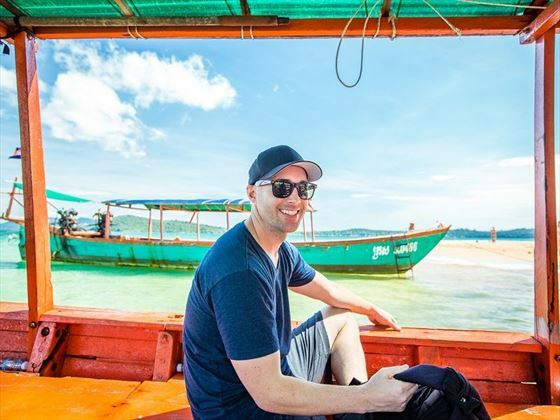 Other optional activities include taking a trip to the excellent Landmine Museum, visiting Tonle Sap Lake and its floating villages or taking a traditional Khmer cooking class. You can also relax with a massage and enjoy a leisurely dinner and riverside beer in Siem Reap. There are no activities planned for the final day and you can leave the accomodation whenever you like. 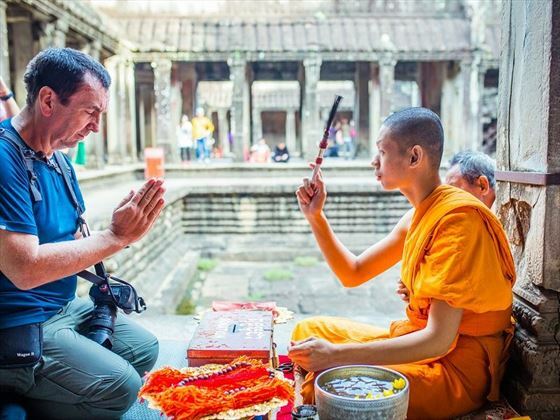 If you have time, squeeze in some remaining activities or shop in Siem Reap market before you leave. Accommodation: five nights in a hotel. Transport: internal flight and private mini bus. Food: five breakfasts, one lunch and two dinners. Activities: Tuol Sleng Prison Museum, Choeung Ek Killing Fields, Royal Palace and Silver Pagoda in Phnom Penh. 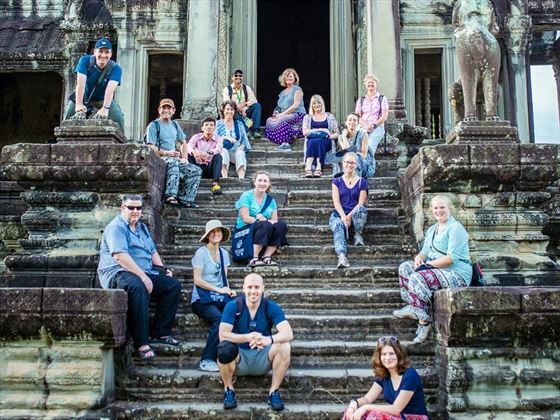 Three day Angkor pass and Angkor temples guided tour and the Angkor Centre for Conservation of Biodiversity in Siem Reap. This tour is not suitable for anyone under the age of 15 years. Amazing savings Book your holiday by 3 May 19 and receive up to $230 discount. Travel before 15 Dec 19. A nine-night small escorted adventure tour through Cambodia, exploring the likes of Phnom Penh, Kampot, Kep, and the world-famous Angkor Archeological Park. This is the ideal way to learn more about this beautiful country and its rich culture.